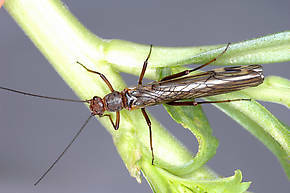 Like most common names, "Needlefly" can refer to more than one taxon. They're previewed below, along with 2 specimens. For more detail click through to the scientific names. 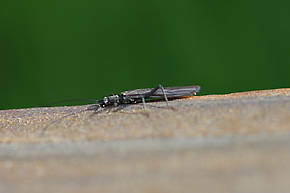 These are often called Needleflies. Leuctra is the only genus of any known importance to trout anglers. Their wings are rolled to a needle-like point; hence the common name, needle flies. Megaleuctra stigmata (Little Black Needlefly) Stonefly Adult View 3 PicturesThis is one of rarest stoneflies in western Montana. It is a bit unusual that it is fairly abundant in a handful of streams that empty into the east side of Flathead Lake. A very beautiful bug. Ernest Schwiebert notes in Matching the Hatch that trout are very fond of these uncommon stoneflies when they are available.